They say if you’re going to copy someone, copy from the best, right? Fiat has got the idea. Instead of pouring millions of research into building a new roadster, the Italians teamed up with Mazda, borrowed the platform to the MX-5, and created something “entirely” different, a homage to the original 124 Spider from nearly 50 years ago. It wasn’t a simple copy and paste job. No, Fiat didn’t want to compete and fight head to head with the best selling roadster in the world. 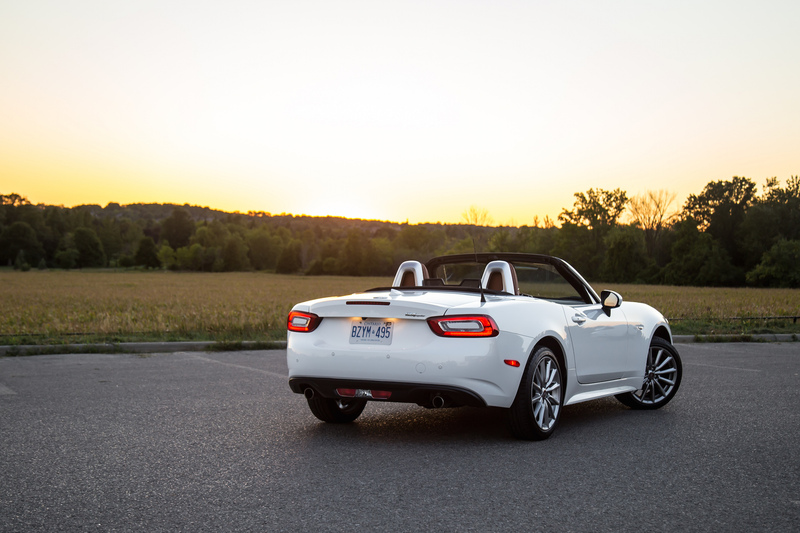 Instead, Fiat kept the MX-5’s fundamentals and chose to go down a different path to open-top bliss. 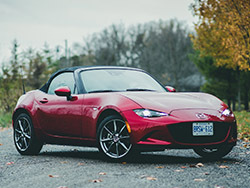 They transformed the MX-5 into their own variation of a livable and friendly roadster with larger dimensions, better cabin insulation, a bigger trunk, and a quieter engine. The result is a creation the world has come to know as the Fiata, or the Fiat 124 Spider, officially. Is it more than just a rebadged Miata? Well from the outside, you wouldn’t have guessed that this Italian has Japanese bones. It looks sleek and polished. This new Fiat undoubtedly borrows cues from the 124 Spider of yore and looks to the past for inspiration. Most of our editors don’t seem to agree with me on its immortal beauty but alas, looks are subjective. I’ve never seen a white Miata before, so this elegant pearl coating on our Fiat makes it look, to my eyes at least, twice as expensive as the Mazda. The lines turn lustrous, the saddle brown seats give it an appealing contrast, and the body shape helps accentuate those aggressive front hood creases. Some of our editors have given the sheetmetal a fair bit of criticism however, like the frog-like front fascia that billows out like its ready to pounce, and the oversized FIAT badges that hang front and back. They also noticed that the Fiat is longer than the MX-5 mainly due to the lengthened overhangs but in my opinion, the 124 Spider’s low stance and long hood give it better proportions than the MX-5. 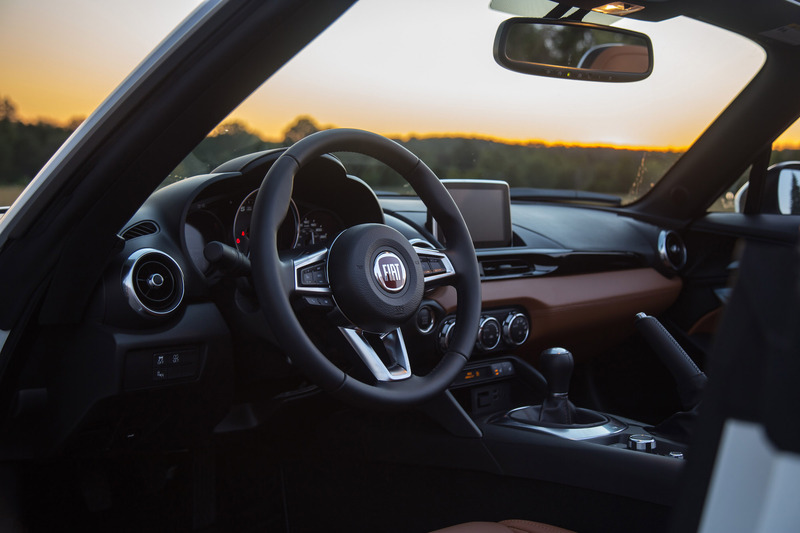 At first glance, the Fiat’s cabin may feel like a quick botch job, but it is marginally more luxurious and supple than the MX-5 it gets its foundation from. The steering wheel rim is thicker and less leathery – more like the Lavalina leather from BMW’s Alpina vehicles – and though the wheel-mounted buttons are the same, the center cap is harder and a rougher texture. Other differences? 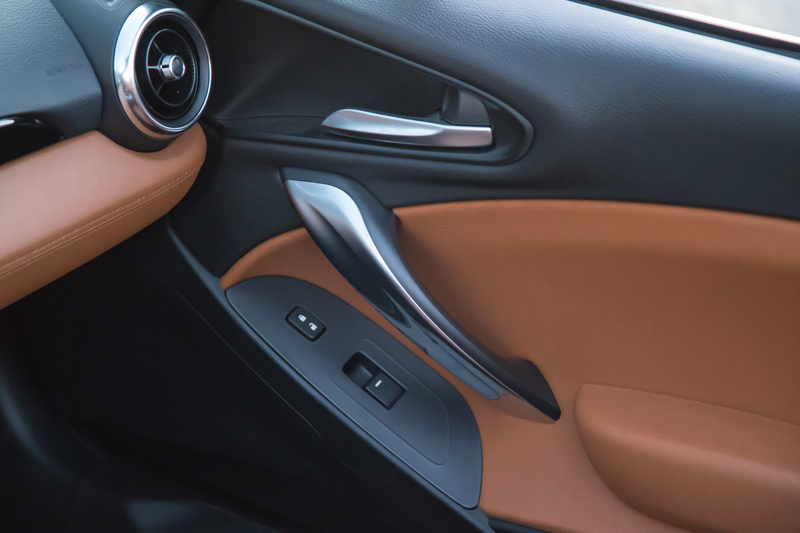 Fiat has added in some door handles on the side panel, you know, for those oh sh** moments, and it also comes with different seats that feel better bolstered and more supportive. A different knob that looks like the Corvette’s graces the center shifter, and even a rear view camera comes standard on the mid-level Lusso trim, which the MX-5 noticeably lacks. But if you’re having trouble parking this tiny little car anyway, you might want to look elsewhere. 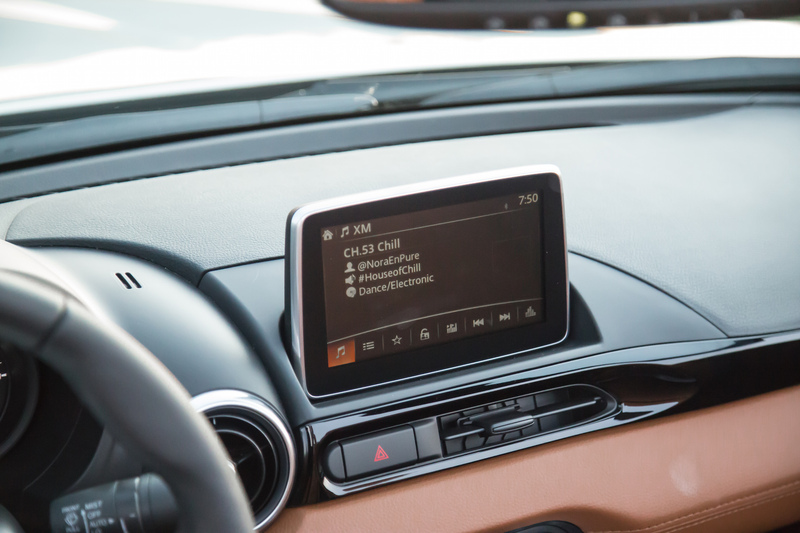 Fiat didn’t even bother messing around with the infotainment unit – it’s ripped straight off the MX-5. The Bose headrest speakers also stay put. Wind turbulence in the cabin hasn’t changed either – your hair will still get a remolding every time you hit triple speeds on the highway. Overall the interior changes are minor, but the modest alterations are enough to give the cabin a quick Italian garnish. 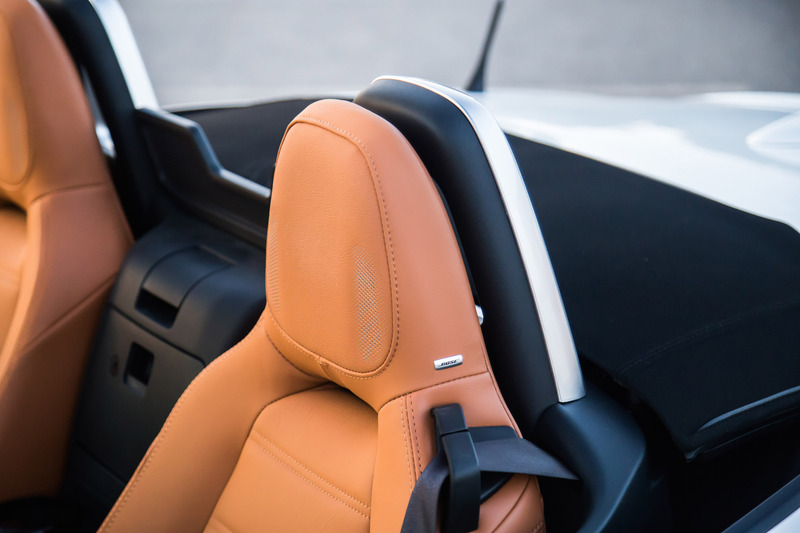 The longer hood gives you the sense that you’re sitting further back in the car, almost like a GT-like position, which alludes to the biggest difference by far from the MX-5, the heart beating under the hood. Replacing the 2.0-litre four-cylinder unit from the MX-5 is Fiat’s own 1.4-litre MultiAir turbo-four borrowed from the 500 Abarth (with 4 extra psi of boost) that is instead mounted longitudinally and delivers 160-hp and 184 lb-ft of torque. Turbo Miata? Hell yeah! Those figures are also 5-hp and 36 lb-ft more than the ND MX-5. 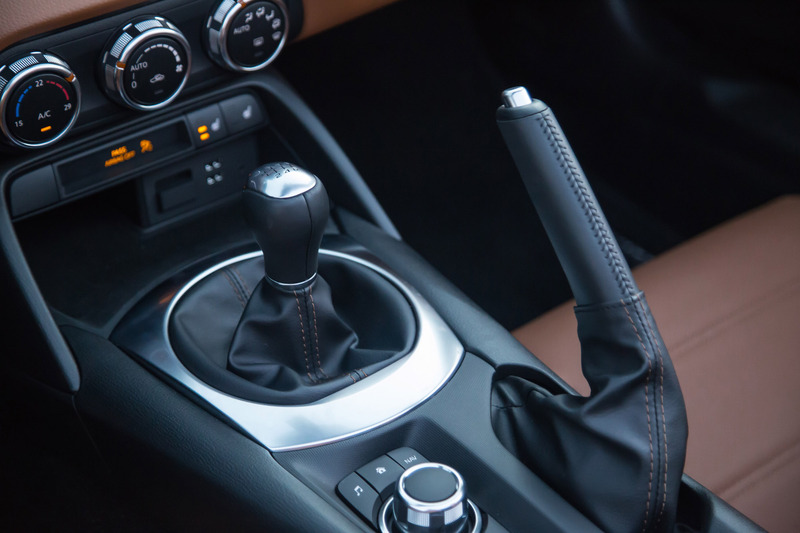 The 124 Spider also receives the six-speed manual from the previous gen (NC) MX-5, with an available automatic for those who truly refuse to row their own gears. 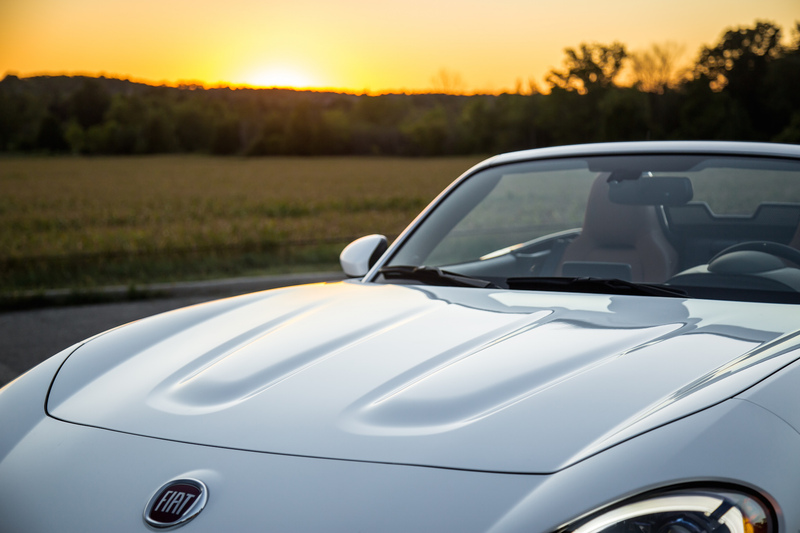 Now, a turbocharged Miata may sound like heaven on earth but there are a few catches. 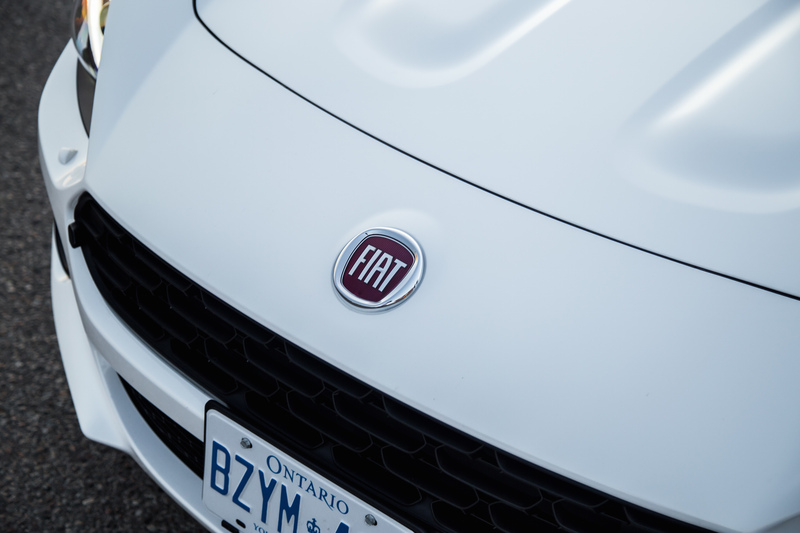 You see, the Fiat feels geared and tuned towards leisurely cruising and a subdued but relaxed experience. Hear me out. 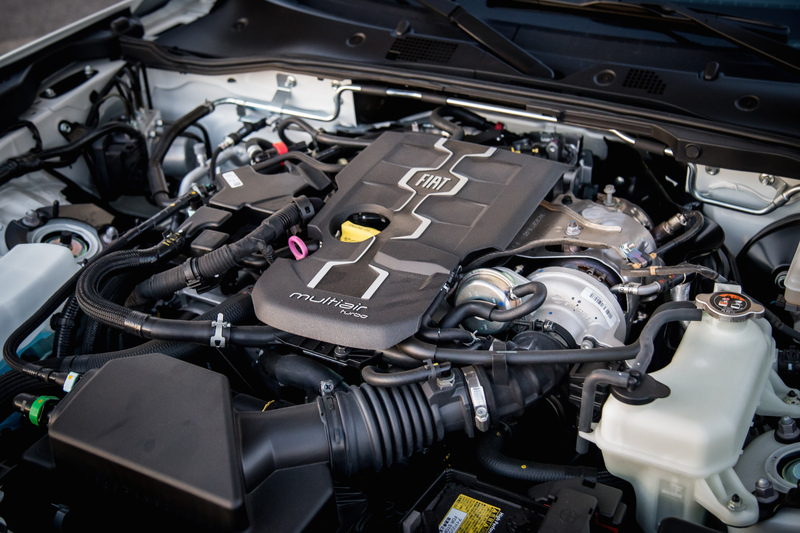 Though the turbos are somewhat quick to spool, it is not worth exploring past 5,000 rpm – not much boost lives up there. This makes the Fiat drive incredibly differently than the full-wrung MX-5. In the Mazda, you rip that 6,800 rpm redline to shreds with the tach needle, juicing every ounce of pulp out of that naturally aspirated blender. In the Fiat however, you get turbo lag and a brief pause before a wafty invisble force shoves you into the back of your seat. The steam quickly buffers out too, losing energy at the high rpm range, unlike the Skyactiv freight train that chugs along until it derails. The 124 Spider’s power delivery is less linear due to that boost too. It doesn’t rev as quickly, as eagerly, or as aggressively as the Mazda. It’s not so much a race to the red as it is riding the wave. The turbo lag really zaps the fun and confidence around corners if you’re running below 3,000 rpm. Picture yourself mid-corner, you feel the understeer plowing on and you want to get the tail rotating. Well at that point it’s already too late, Should’ve thought of that sooner. The moment you hit the throttle, nothing happens. A brief pause ensues before the turbos spool and finally wake up. The Fiat is not crazy quick either. Though for brief “boosty” moments it may feel quicker than an MX-5, the Fiat is still loading on more weight due to the extra bracing, insulation, and dimensions. Its longer nose isn’t as eager to point, but hit that throttle pre-apex (plan ahead, this time), wait for the turbos to kick in, and the rear happily swings wide for a rewarding drift. It’s easy to control too, though the lack of a limited-slip differential really shows (the MX-5 GS/GT get one). 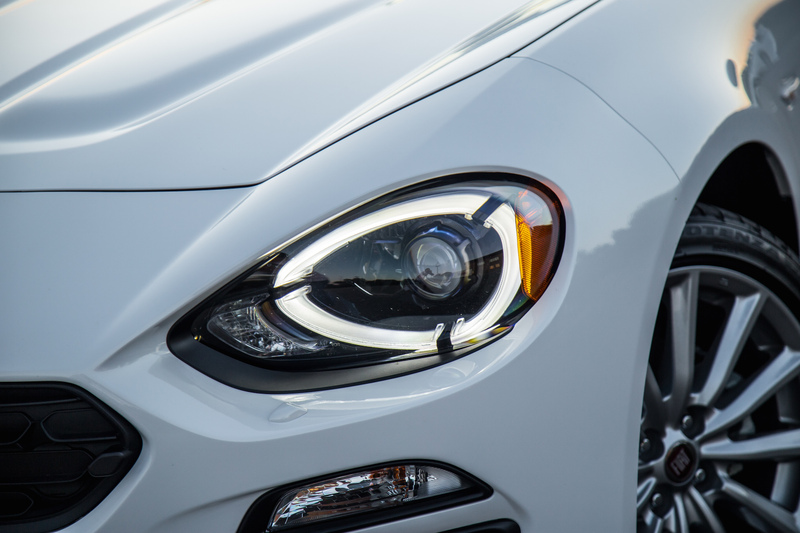 Performance aside, the Fiat is noticeably more comfortable to drive around town. It feels better mannered than the MX-5, with a less intrusive exhaust note and a composed and relaxed interior environment that benefits from that added insulation. It’s like a grown man’s MX-5. The lack of exhaust noise in our Lusso-trimmed tester does hinder the excitement if you’re looking for some adrenaline pumping fun. You do hear your fair share of turbo whooshes when they manage to penetrate into the cabin, but it’s not as screechy or fiery as the mechanical whirl from the Mazda. 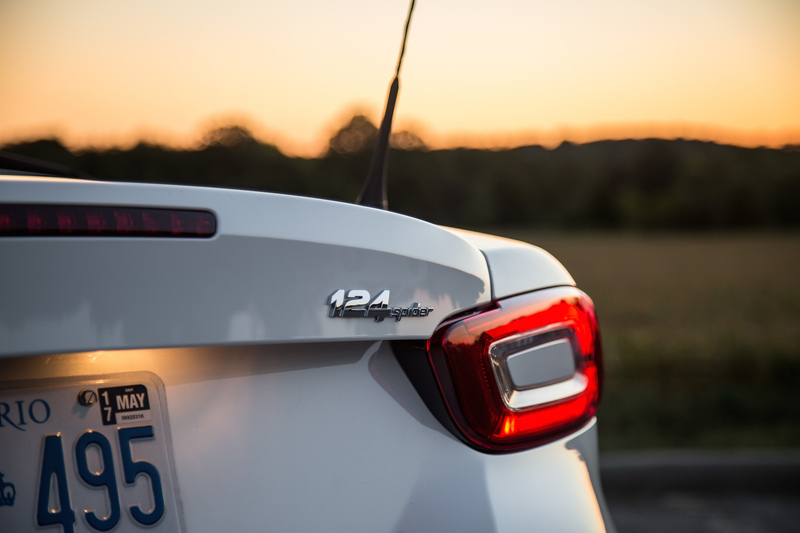 We’ve been told the 124 Abarth with its sport exhaust system is a different story. There’s even an available aftermarket MOPAR exhaust. More on that when we actually test one. There are three models you can choose from: Classica, Lusso, Abarth. 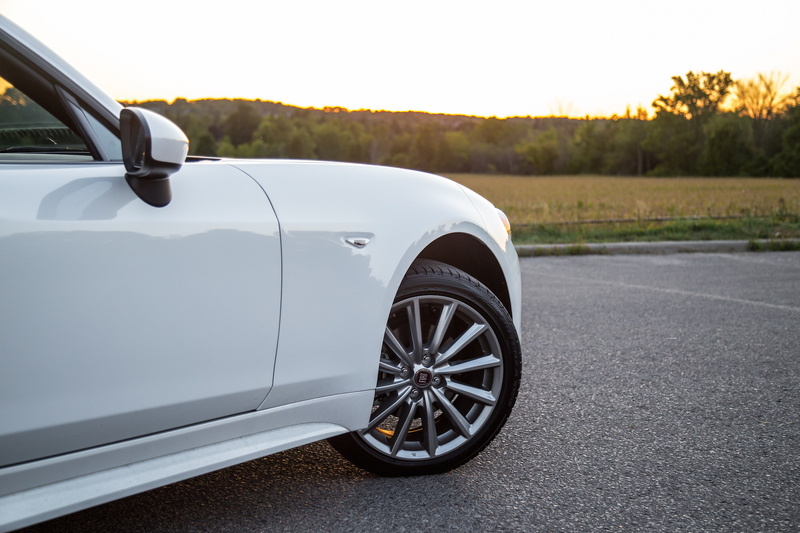 We tested the middle trim, the Lusso, which is geared towards a more luxurious driving experience with 17-inch wheels, chrome exhaust tips, automatic headlamps, heated seats, keyless entry, and a rear view camera, just to name a few of the notable options. The slightly more expensive Abarth model on the other hand gets you a more aggressive bumper, wheels, quad exhaust tips, and also a minor hp bump up to 164-hp. You also get a limited slip diff, a front strut tower bar, optional Brembo brakes, and aforementioned sports exhaust. Sans the options list, the base 124 Spider Classica’s sticker price undercuts the MX-5 GX by a meager $330. But the top-spec Abarth costs $3,130 less than the fully-loaded MX-5 GT, but these prices can be misleading. 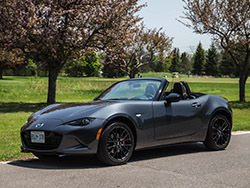 Whereas the MX-5s have no real options list other than paint colours (and a Sport Package on the mid-level GS model), the Fiat comes with optional premium packages that can cost north of $4,000 for features like blind spot detection, Bose speakers, LED headlamps, and GPS navigation. 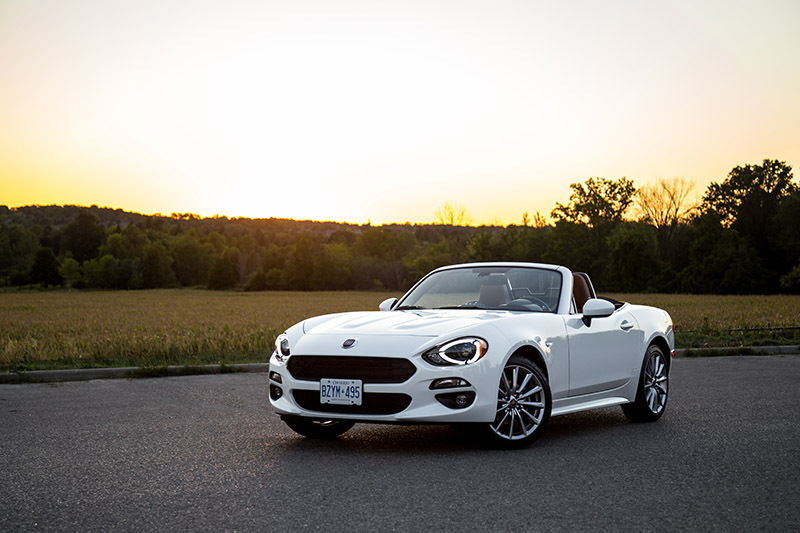 The Fiat 124 Spider is a welcome resurrection of a timeless roadster, whose only real downside is that the MX-5 exists. If Mazda had not conjured up such a wonderful two-seater, we would be falling head over heels for the Italian. But it does exist, and it is only natural to draw comparison to the world’s best selling roadster. Does the Fiat impress? It sure does, and Fiat has played the game smart. Instead of butting heads, they’ve molded a sporty roadster into a mature boulevard cruiser. 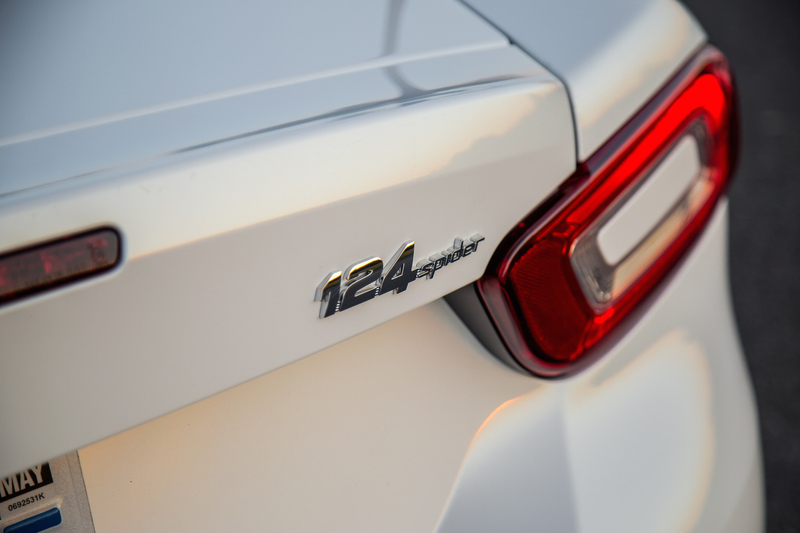 Though it may be small in its stature, and its exhaust note not very convincing, the 124 Spider delivers on its wonderful road manners and excellent cabin insulation. 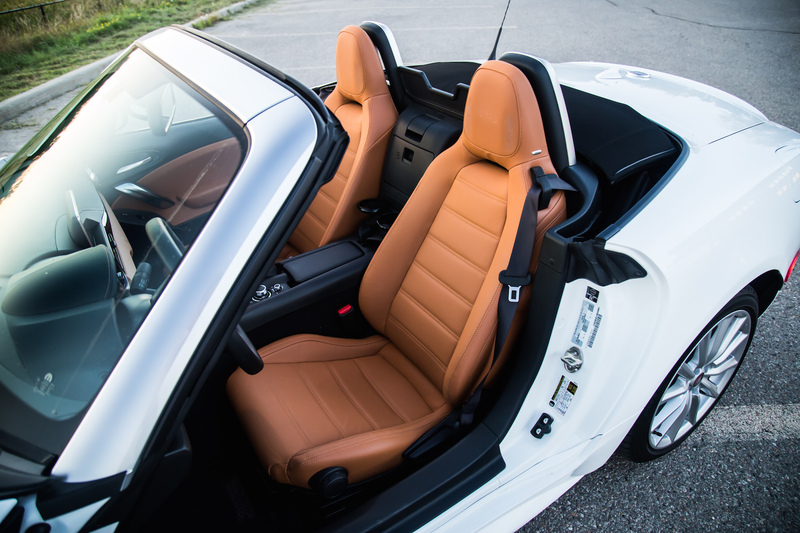 Looking for a sporty corner carving open-top? Miata is still your answer. 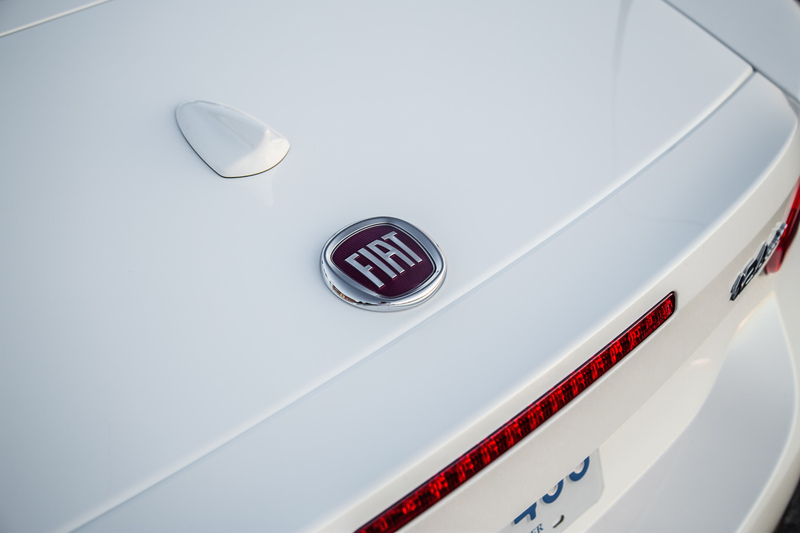 But if you want something a little more comfortable, a little quieter, and better mannered around town, then the Fiat just might be your solution. 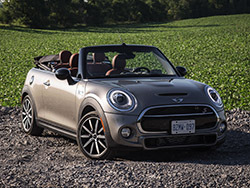 Review: 2016 MINI Cooper S Conv. 2016 MINI Cooper S Conv.